You'll be £4.99 closer to your next £10.00 credit when you purchase Great British Adventurers. What's this? The adventurers in this book are at least loosely British and, although heroes in battle are not represented, there are certain (representative) female secret agents of the Second World War, whose acts (in voluntary service, beyond the call of simple duty), surely took them out of the arena of straight-forward battle and into the realm of the most individual and courageous adventure. The overall objective is to renew interest in the lives of some of our real heroes and heroines, as representative of the many others that there are; in an age in which contemporary sporting and pop art ‘heroes’ dominate the news and provide the only readily evident ‘inspiration’. The subjects, who are generally lesser known adventurers, are drawn from the nineteenth and twentieth centuries. The feats cover a wide spectrum, from Sir Richard Burton’s daring in making the Hajj pilgrimage to Sir Thomas Lipton’s gentler adventures, in the nature of trade, in seeking out sources of, and markets for, tea. Yet each made a memorable contribution to the world. Some of the subjects were very, very good; some of them were very, very bad, and they all share the characteristics of: originality; a sense of self-determination, unfettered by the diktats of Tin-Hitlers; a thirst for living; perseverance and persistence, even defiance; many of them showed bravery, some of them to a truly exceptional degree and they all lived without the wish to have lived more quietly. In short, they shared a rage for life and yet also managed to see beyond themselves and the times in which they lived. Packed with tales of ‘derring-do’ and keeping a stiff upper lip in the face of adversity, this new guide thrusts the country’s well known, and lesser-known, adventurers of the centuries past and present into the limelight. The book introduces 26 male and female characters, whose achievements have contributed to society’s progress and understanding since the 19th century. Read about feats from the likes of aviator Amy Johnson CBE and sailor Dame Ellen MacArthur. All pioneers in their field, from missionaries to pilots, their stories are an inspiration. If the Brits have been renowned for producing eccentrics down the ages, many of them have at least been equally marked for their bravery and eagerness to explore every dark corner of the Earth. 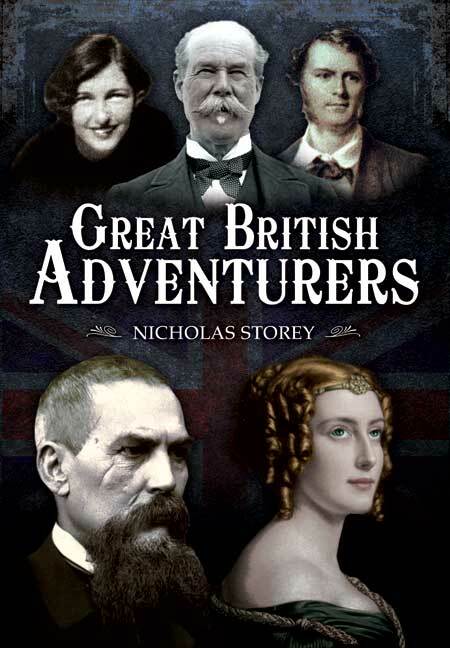 Great British Adventurers is an enjoyable collection focusing on the lives and deeds of 26 such characters from the 19th and 20th centuries. Nicholas Storey was born in Cornwall. After reading law at University College, London, he qualified as a lawyer and then worked in legal publishing, the government legal service, the city and also spent some time in private practice, before deciding to move to Brazil, to find the time and space in which to write. He is one of two general editors of a text book on health service law and practice and various articles and letters in the British national and local press (as well as The Rio Times); several online publications and is the author of the well-received History of Men's Fashion.